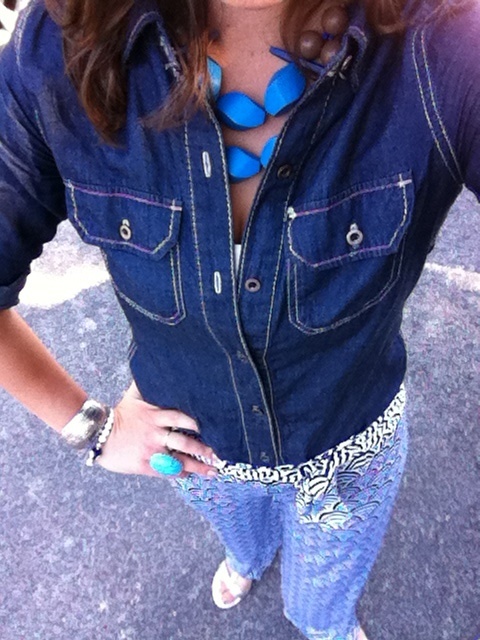 Today's chambray is paired with navy and white scale-print palazzo pants and silver and blue accents. The necklace is even more fabulous, for costume jewelry, because it's made from different shaped wooden beads (it won't turn on you) in bright blue, sapphire, and taupe. The palazzo pants kept me cozy yet tailored as I went to a few business appointments today and then took the afternoon to play with my pup.